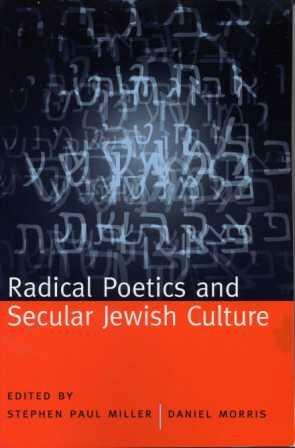 Just published by the University of Alabama Press: Radical Poetics and Secular Jewish Culture, edited by Stephen Paul Miller and Daniel Morris. Both Miller and Morris edited earlier volumes for the NPF. Miller — with Terence Diggory — prepared The Scene of My Selves: New Work on New York School Poets (2001). Morris assembled a special issue of Sagetrieb dedicated to the work of Allen Grossman (link here), which is also available as a freestanding book: Poetry’s Poet: Essays on the Poetry, Pedgagogy, and Poetics of Allen Grossman (2004). Kafka’s quip — paradoxical, self-questioning, ironic — highlights vividly some of the key issues of identity and self-representation for Jewish writers in the 20th century. No group of writers better represents the problems of Jewish identity than Jewish poets writing in the American modernist tradition — specifically secular Jews: those disdainful or suspicious of organized religion, yet forever shaped by those traditions. This collection of essays is the first to address this often obscured dimension of modern and contemporary poetry: the secular Jewish dimension. Editors Daniel Morris and Stephen Paul Miller asked their contributors to address what constitutes radical poetry written by Jews defined as “secular,” and whether or not there is a Jewish component or dimension to radical and modernist poetic practice in general. These poets and critics address these questions by exploring the legacy of those poets who preceded and influenced them — Stein, Zukofsky, Reznikoff, Oppen, and Ginsberg, among others. While there is no easy answer for these writers about what it means to be a Jew, in their responses there is a rich sense of how being Jewish reflects on their aesthetics and practices as poets, and how the tradition of the avant-garde informs their identities as Jews. Fragmented identities, irony, skepticism, a sense of self as “other” or “outsider,” distrust of the literal, and belief in a tradition that questions rather than answers — these are some of the qualities these poets see as common to themselves, the poetry they make, and the tradition they work within. This entry was posted in NPF Authors and tagged "Introduction" Charles Bernstein, "Meet the Preface" Daniel Morris, "Radical Jewish Culture / Secular Jewish Practice" Hank Lazer, "Who or What Is a Jewish American Poet, Adeena Karasick, Alicia Ostriker, Amy Feinstein, and Jerome Rothenberg" Jerome Rothenberg, Benjamin Friedlander, Bob Holman, Bob Perelman, Charles Bernstein, Charlie Bertsch, Daniel Morris, Eric Murphy Selinger, Joshua Schuster, Kathryn Hellerstein, Maria Damon, Marjorie Perloff, Meg Schoerke, Merle Bachman, Michael Heller, Norman Finkelstein, Norman Fischer, Paul Auster, Rachel Blau DuPlessis, Ranen Omer-Sherman, Stephen Paul Miller, Thomas Fink, with Specifi c Reference to David Antin. Bookmark the permalink.